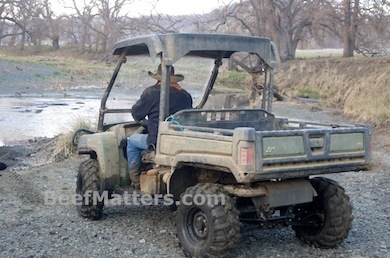 As much as we enjoy our time horseback, there are occasions when we use the Gator for ranch activities. 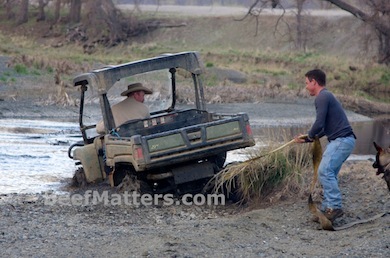 It is unbelievably easy to throw protein supplement in the back of the Gator to take out to the cows. Or throw in a few fencing supplies and buzz around a field checking fence. 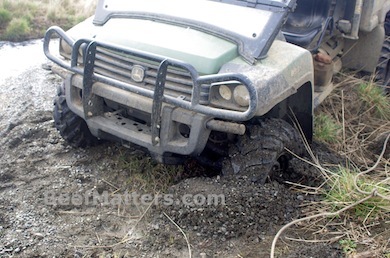 In our zeal of zipping around the pasture, we occasionally get the mighty Gator stuck. During the walk back to headquarters, we remind ourselves of the limitations of machines and the grace and majesty of our horses. 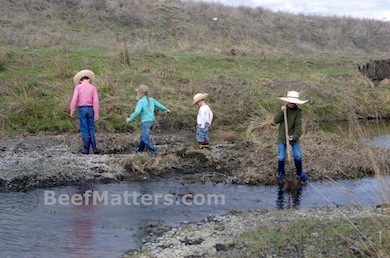 When we return to the scene of the burial, with a truck load of kids, chains and shovels our good humor has usually returned and we set off on our mission once again, on the Gator, of course. 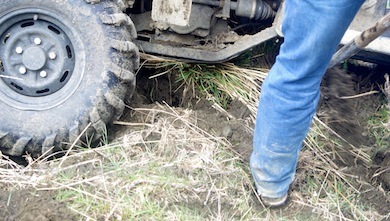 We set a new record this time: getting the Gator stuck twice in one day. For the second time today, cowboys walked back to the ranch. Not being the one who walked 5+ miles in wet boots, through rocky pastures, I found it hilarious. 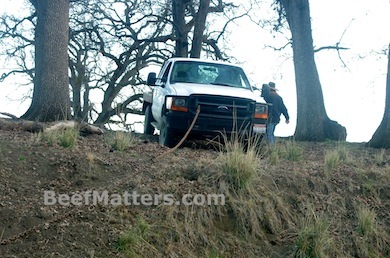 Once again, we loaded the pick-up and set about on our second rescue mission of the day. 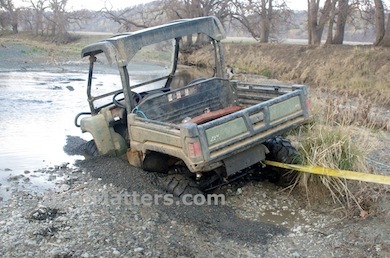 It took a little work, but eventually the Gator was out of the mud and on solid ground again. On the way home, everyone agreed to park the Gator and use horses as our preferred mode of transportation. Knowing my cowboys and their somewhat unreliable short-term memories, I took the liberty of stashing a shovel and a water bottle in the Gator.